John Wilson is one of Australia’s leading fine art oil painters, whose elegant pictures capture the elusive qualities of the landscape in a unique and gentle manner. 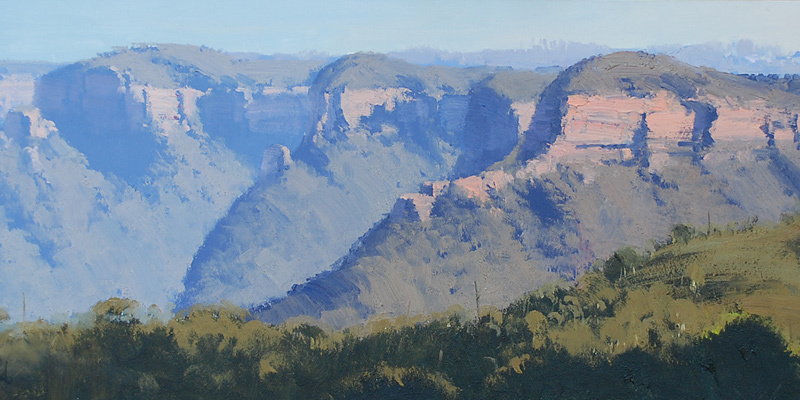 For John, growing up in the beautiful Blue Mountains of NSW instilled a deep love of the rugged grandeur, spectacular colours and the many moods they inspired. Whilst always fascinated by paintings and artists, John did not pursue his interest in art with real seriousness until his mid twenties. He had been working as a professional musician and wandered into painting as a hobby. It was not long before he decided to devote himself completely to becoming an artist. He is now an award winning artist who is recognized internationally, and is represented in public, corporate and private collections here in Australia and overseas. John’s first exhibition was in 1979, and he has had 25 solo shows and exhibited with many other artists since then, including exhibitions in London, Japan and the United States. He is a fellow of the Royal Art Society, a patron of the Society of Mountain Artists and his works have been reproduced in many books and articles.